[Sept 2017] There's a flavor of the month with "Waffle" in the name? Just let me check the calendar, yup, it's clear now. To the lunchmobile! 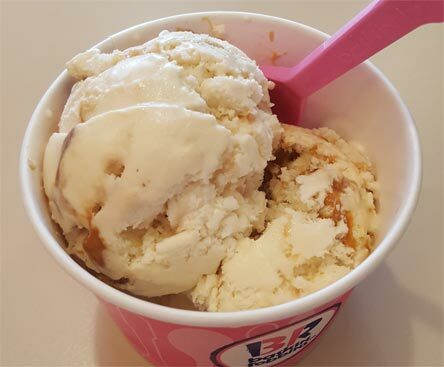 This is a (rather small) double scoop of Baskin-Robbins latest and greatest and it made for quite a tasty lunch. We don't get maple flavors very often and this one here is an easy win. There's plenty of maple flavor with a bit of saltiness in every bite. There are the delightfully fresh tasting pecans. To be honest, it would have gotten a thumbs up at this point from me. To be clear though, I was promised a "Belgian Waffle" flavor and deep down I really just got a really nice maple flavor. I didn't hit any major waffle bits until the end of the second scoop. For most bites I just wasn't thinking about waffles. I was happy, I just wasn't waffle happy. Maybe a bit of brown sugar and some added textural component would have helped drive the waffle vibe, but it wasn't meant to be in my particular serving. 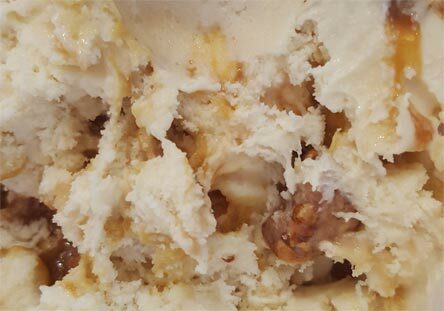 No matter what, you will get a really nice maple ice cream, just keep in mind that the waffle factor will vary from scoop to scoop. I'm pretty sure this flavor would be amazing on a fresh waffle. I thought this was excellent. The base is maple praline, so I don't think it's intended to taste like waffles. I got plenty of waffle pieces, though. I suppose having waffles in a maple syrup base is as close as it's going to get. I don't want waffle flavored ice cream - but waffles in maple ice cream is nice. They don't claim the base tastes like a waffle. It would be boring if it did. HA Fair enough! you are right, they never claim a specific waffle flavor, I'm just being a stickler for semantics. I want to be able to judge a flavor by it's name, not by it's description. Uuuuh an ice cream base that tasted like a SWEET fresh sugar-infused caramelized waffle (not plain frozen waffle) would be amazing. Pancake and Waffle flavored ice cream must be the latest trend I guess. Halo Top even has that flavor (though I haven't tried it yet). I don't have Baskin Robbins or Cold Stone Creamery where I live so I'd love to see Ben and Jerry's, Haagen Daz, Turkey Hill or Bruster's try things like this. I agree that this flavor definitely didn't ring the waffle bell while I was eating it, and I can't say that I even noticed waffle bits in it. That said it was quite tasty (and also not an Oreo flavor for a change), and that's enough for me!